The Michigan Auto Law Car Accident Injury Survivor Scholarship is an annual scholarship that we offer college students who were victims of car accidents earlier in their lives and have overcome their injuries while pursuing an education. Through our scholarship, we strive to honor those victims as they continue to persevere through their recoveries and as they push forward to continue their educations. They have already achieved so much and we are excited for what they can achieve in the future. This year we are honored to recognize scholarship winners – Glenneisha Darkins and Danielle Keim – for their perseverance and strength of character. Rebuilding one’s life – and, in some cases after a car accident, building a whole new life – after having sustained serious, life-altering injuries is an extraordinarily difficult, demanding, painful and emotional journey. Never is this more true than when the car crash victims who are forced to make this journey are young people, who have only just begun to live their lives. The auto accident attorneys at Michigan Auto Law know this based on our extensive experience helping car crash victims and representing them in court when insurance companies wrongfully deny or cut-off their No-Fault benefits. Again, congratulations to Glenneisha and Danielle and we are grateful to you for sharing your inspiring stories with us. Michigan Auto Law offers the Car Accident Injury Survivor Scholarship every year with a Dec. 31st deadline. For more information, including eligibility, the application form and the application deadline, please visit our Michigan Auto Law Car Accident Injury Survivor Scholarship page. Eight years ago, Glenneisha was a passenger in a car with friends when the vehicle was involved in a rollover crash in Florida. Tragically, she suffered severe head, neck and spinal cord injuries which left her quadriplegic. Since then, Glenneisha has struggled not only with the challenges of continuing her education, but also with the daunting adjustment of becoming dependent on others to fulfill her basic needs. 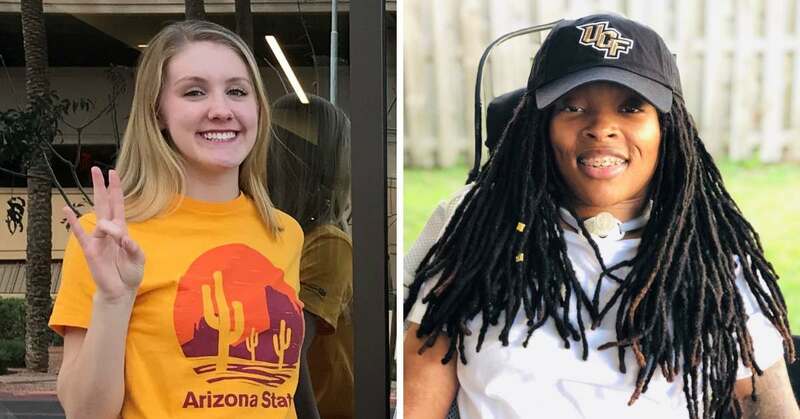 In light of the significant changes to her life that were brought on by her injuries, Glenneisha’s discussions with professional therapists convinced her to enroll as an online student, thereby allowing her to earn her undergraduate degree in psychology at Florida International University in 2018. But Glenneisha did not stop there. Wanting to learn how she could help others, she enrolled in the University of Central Florida’s online program to pursue her Master’s Degree in Social Work. We wish Glenneisha continued success with her graduate studies and we thank her for setting such an inspiring example. Danielle was finishing up the second semester of her senior year of high school when she was injured in a highway rollover crash involving a commercial truck in early 2018. Left dangling upside down from her seat belt, Danielle suffered a concussion and severe neck injuries as a result of the crash. Despite the ongoing and frequent pain, light sensitivity, memory loss and headaches that she suffered – as well as the numerous doctor appointments she had to attend – Danielle was able to eventually graduate from high school. We wish Danielle the best as she pursues an undergraduate degree at ASU and we thank her for setting such an inspiring example. To understand more about neck and head injuries and how car accident survivors are affected, visit our Personal Injury Resources page. What is the Michigan Auto Law Car Accident Injury Survivor Scholarship? We understand how difficult it can be to recover after a serious car accident injury, especially for young car crash victims. In order to recognize their struggles, acts of heroism and hard work, Michigan Auto Law offers its annual Car Accident Injury Survivor Scholarship to college students who were victims of car accidents at some point in their lives and who have overcome their injuries to pursue an education. Our mission is to lend a hand to those who have survived serious crashes and who are demonstrating resolve and determination to rebuild their lives. To learn more, please click on Michigan Auto Law Car Accident Injury Survivor Scholarship on the Michigan Auto Law Scholarships page.